I went to the doctor today. My parents work as dentists at a medical building and there are a bunch of other doctors working there as well. Today I went for a check-up with my new doctor that my parents go to. He works right across from my parents office. I don't like him! My parent's friends that are doctors always ask..."What are you studying?" and I'm like "Architecture". And then they make this weird face. Then they always lecture me about how it is such a waste that I'm not studying to become a dentist...since the office would already be ready and all the patients...bla bla bla. This doctor was telling me that parents should force education on kids and decide what they should study. I wanted to punch him the face. He doesn't believe in loving your job. My parents...even though they wish I would study dentistry told me this story of their dentistry professor in Sweden. His parents forced him to become a dentist. He hated his life and always wished he could pursue his love for painting (and he was really good). He always told them that it was after he retired that he was truly happy. Even though you have a high paying job, doesn't mean you will be happy. That's what I want most of all....to have a happy life. I'm so glad to get that off my chest. Crap like that pisses me off. Anyway...for my sister's birthday last week, we went to P.F. 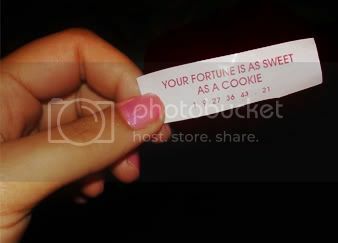 Chang's and I got the weirdest fortune! PS. Some of you have told me that your comments aren't appearing...I have no idea what the problem is ;___; I thought it was the spam remover that was deleting your comments...but it's not~ Does anyone know what's going on?? ?